I've created a PixarCarsDiecast.com Fantasy Football League (for the 2015 NFL season)... I'd like to get 8 to 10 teams... no cost to join... no real prizes (just bragging rights). If you are interested in being part of the league, please let me know - send me a PM containing the e-mail address that you'd like me to send an invitation to. So far we have 3 confirmed teams and I've sent out 5 additional invitations... I've also talked with a couple more people... I'd like to have 8 or 10 people participating. We currently have 4 confirmed entries in the league... there are 5 more people who have requested invitations and I have sent them out... we have to end up with an even number of teams... I've got 2 more people that I've talked with about joining. The current maximum number of teams is 10. Additional teams will be filled on a first-come, first-served basis. We are now up to 7 confirmed teams... as we have to have an even number of teams, I'm counting on someone else who has received an invitation accepting. In the event we need 1 more team for an even number I'll create an additional team; in the event we reach the maximum number of 10 before everyone accepts we'll stay with 10. We are now at 9 teams out of the maximum 10 that I allowed - I've not heard back from 3 people who expressed interest... hopefully one of the 3 will confirm their team soon. Chris we're doing an auto draft, correct? We got our 10th and final spot filled last night... there are 2 more people I sent invitations to but unless both contact me in the next 2 days and confirm they want to play I am going to close the roster at 10. Yes, we are going to do an auto-draft... you can either accept the default rankings by Yahoo or rank your own... Jordy Nelson of the Packers has been my person #1 ranked wide receiver (WR) the last several years... however, he tore an ACL during yesterday's exhibition game and is more than likely out for the season... I exclude players on injured reserve (IR) from being drafted when my turn comes up... and again, it's auto-draft, so you don't have to be on your computer. I'm leaning to doing the draft on Sunday August 30 as of now... I'll send out a message as we get a little closer to the time... I figure it will be Wednesday night before I can do my player rankings. I've participated in 3 mock drafts so far... Those of you in the league, I recommend you participate in 10 team mock drafts since we are a 10 team league. And I'm beginning to think it would be best to do our league auto-draft after the conclusion of the exhibition season which is Thursday September 3... I'm now leaning towards Saturday September 5... I'll post in the fantasy league - hopefully everyone got the e-mail after I posted the message? 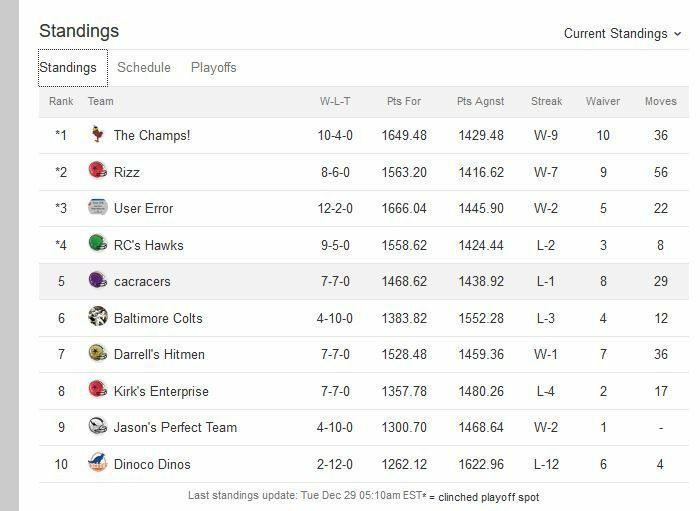 Here are the standings after week 1 in the PCD Fantasy Football League. RCcars5 is in 1st place after week 1 (total points for the tie-breaker)... Ferris is in 2nd... Nitroade is in 4th... and I'm currently in 10th - you mean this isn't like golf where low score wins? Set your lineups soon - week 2 games start this evening... and don't forget you can try your luck at picking winners of the games. RCcars5 continues in first... Nitroade moves up to 3rd... and I solidify my hold in 10th (last) place. In my other league I had the 3rd highest score out of 8 teams but thanks to a horrible Monday night performance by the Colts lost by 1.57 points - the Colts offense has disappeared this year. Remember to set your lineups by Thursday... and don't forget you can pick winners of each game... 5 of 10 picked games this week... that's good to see... and I came in last of those who picked games. 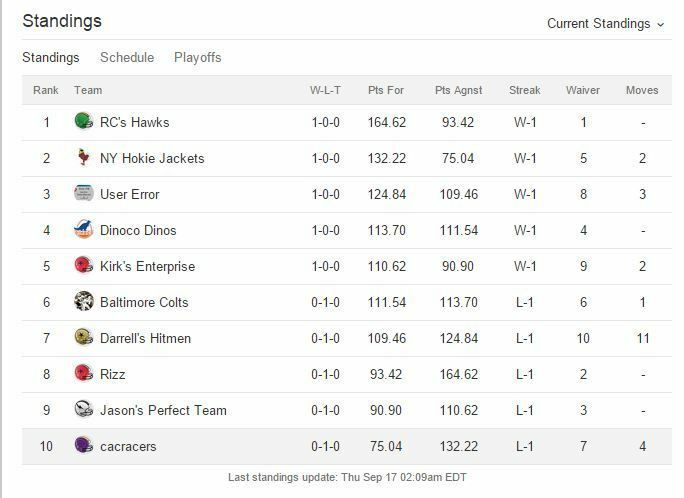 The 14 week regular season of our first PixarCarsDiecast.com Fantasy Football League has completed... the playoffs start this week. I also didn't make the championship bracket in my other fantasy football league. It was interesting having a 10 team league - much more of a challenge to pick up players as needed... I may make a few changes to scoring next year, but we've got time to think about that. 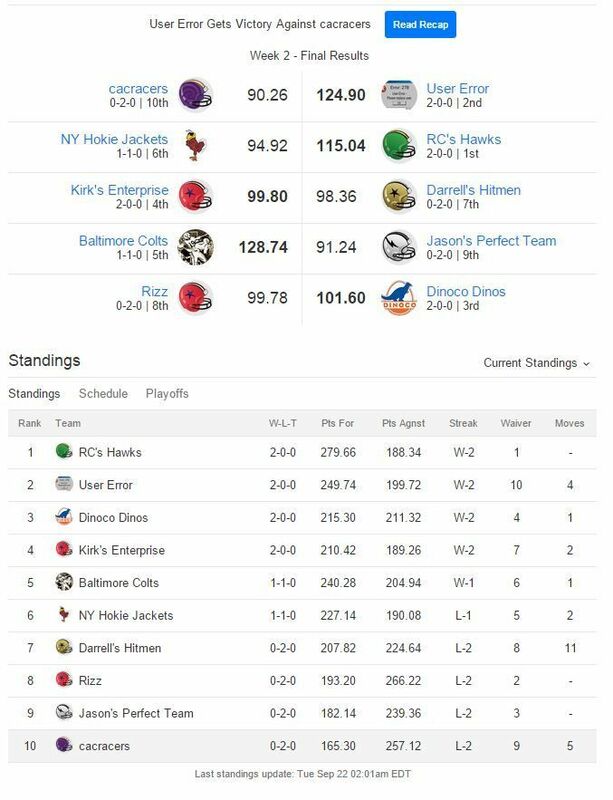 Congratulations to Ferris (Darren) for being the first league champion and to User Error (Marc) for winning the regular season. 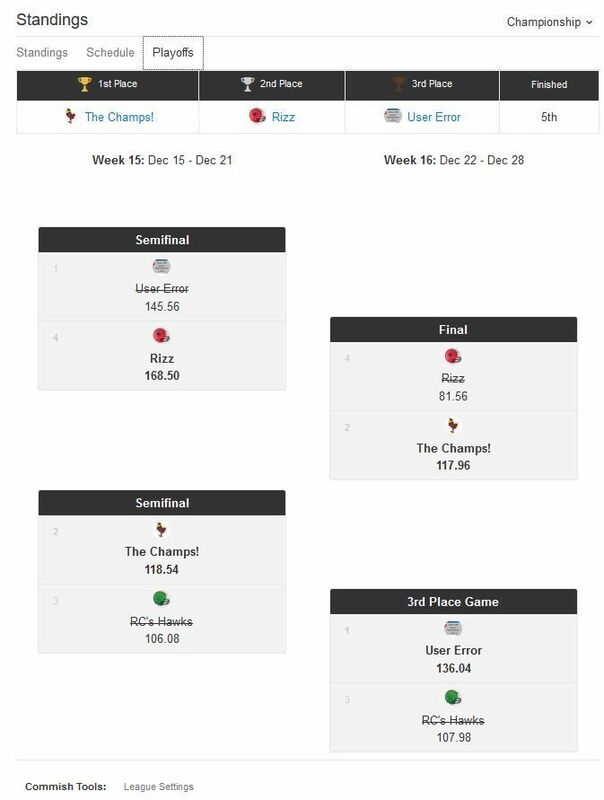 I found our 10 team league to be a little more challenging as far as adjusting the lineup each week than the other league I participated in which is an 8 team league... hopefully everyone will come back next year... I'll make some adjustments to the scoring - I think a QB should receive the same 6 points per touchdown pass that a RB, TE, or WR receive for scoring on a TD pass. 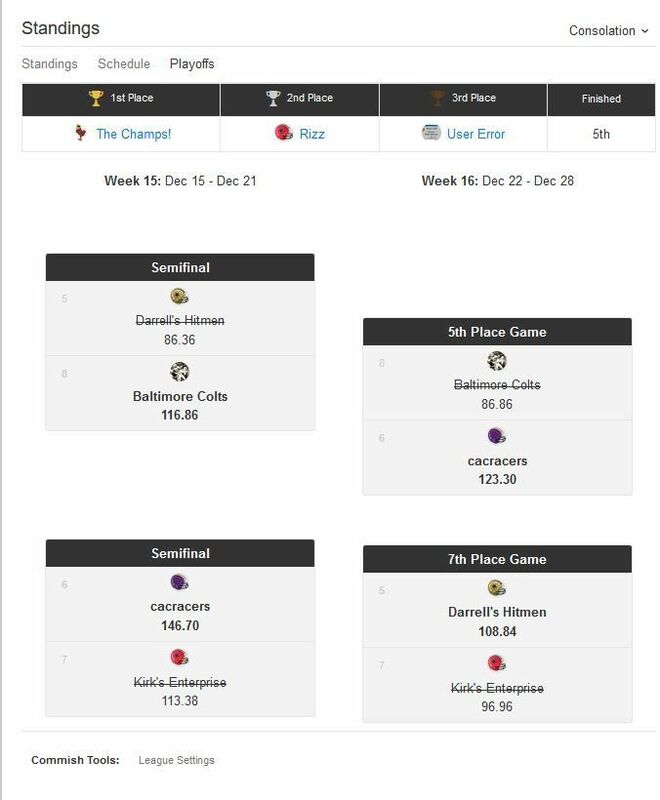 Thanks again to everyone who took part in the PixarCarsDiecast.com fantasy football league.